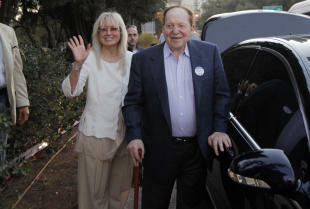 Casino mogul Sheldon Adelson has made headlines by writing enormous checks to help Republicans, including Mitt Romney, and blasting President Barack Obama's record on Israel. Now, a conservative group with ties to Republican House Majority Leader Eric Cantor is putting the spotlight on Adelson's wife by naming a women's issues-themed pavilion on the sidelines of the party's Tampa convention after Dr Miriam Adelson. The YG Network had already announced plans for a "Woman Up!" pavilion — including space for policy discussions and a women's suffrage museum — in Tampa. The "Woman Up!" initiative's apparent goal is to shore up Republican standing among women voters at a time when Obama leads Romney in that critical demographic — a task not made any easier by the controversy over Representative Todd Akin. Now, that pavilion will be named for Miriam Adelson, a doctor who specializes in the fight against drug addiction. She was born in Tel Aviv to parents who reportedly fled Poland for Israel in the days before the Holocaust. She and her husband met on a blind date. and she is credited in some quarters for helping to drive his passion for Israel. "Miriam Adelson's experiences in the Israeli Army, as a working mom, and a philanthropist equip her with a unique understanding of the challenges that women from all walks of life face," Mary Anne Carter, executive director of the YG Network's 'Woman Up!' effort, said in a statement. Carter underlined that Miriam Adelson "has balanced work and family life remarkably." Miriam Adelson earned degrees in microbiology and genetics before getting her MD, according to a biographical sketch on the homepage of one of the charities she and her husband have founded. During a two-year stint in the Israeli Army, she conducted biological research, and then went on to become a leading physician at a Tel Aviv hospital. In the mid-1980s, she came to Rockefeller University in New York City and came face to face with the HIV/AIDS epidemic, which prompted her to open a clinic in Tel Aviv to fight the spread of the disease, and another in Las Vegas to combat heroin addiction. "I am deeply honored," Miriam Adelson said in a statement provided by the YG Network, adding that she looked forward to "discussing the issues important to women from all around the country." (A YG Network official underlined that, while the Adelsons have given to the YG Action Fund, a super PAC run separately from the network, no money changed hands in connection to the pavilion).